Okay, so the pity party is now over. I told you it wouldn’t last long. Things are definitely looking up this week. 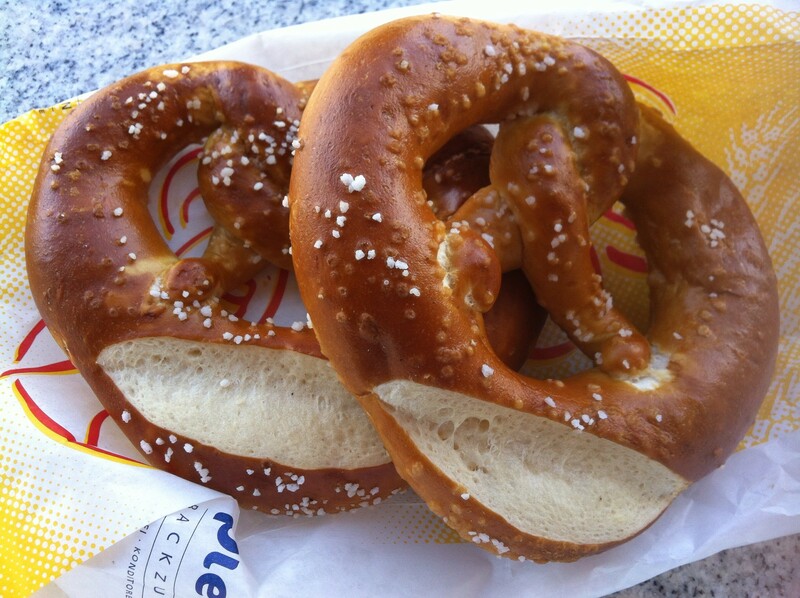 I wanted to share with you one of my favorite things about Europe, the food. 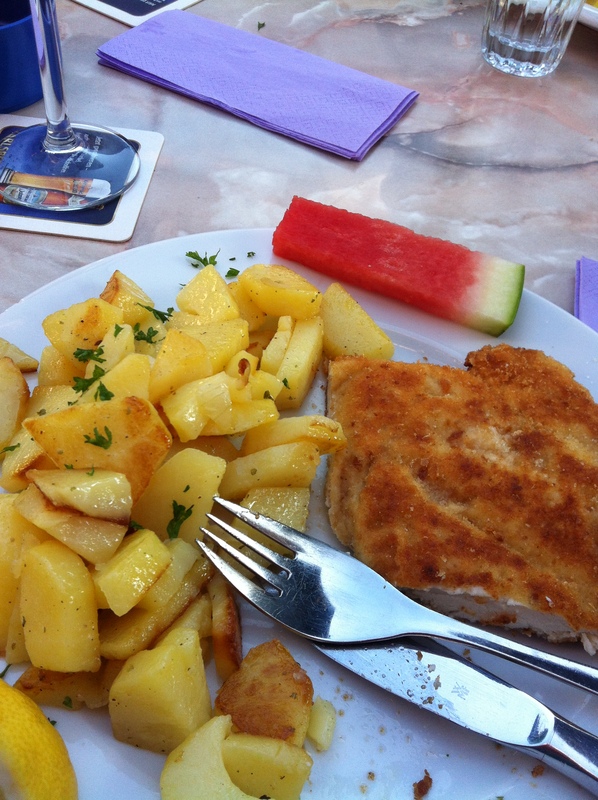 German food is definitely a little less flavorful than what I am used cooking Puerto Rican food. That doesn’t mean it doesn’t taste good. It has its own flavor. I have thrown my restricted diet to the curb much to my stomach’s distress. I am back on track now after my demise but the food was good. 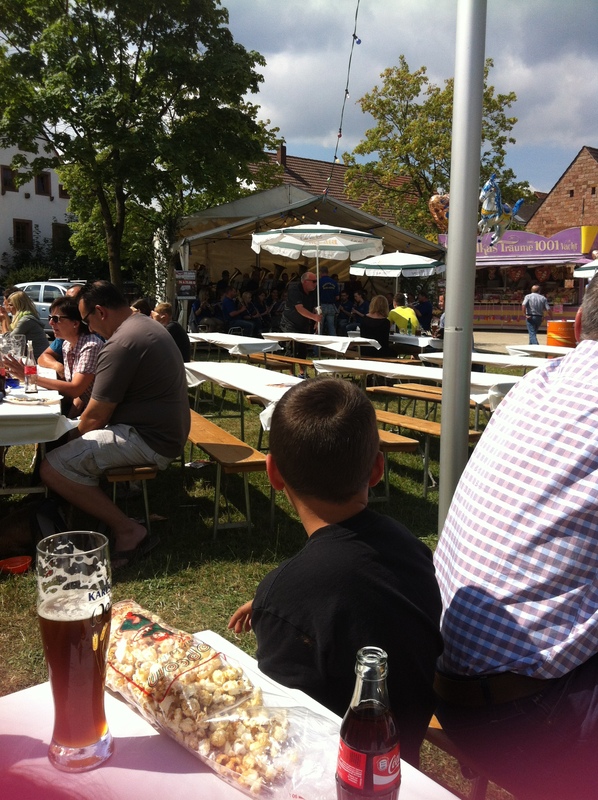 We went to our new village’s festival called Dorffest. I love how Germans celebrate just about everything. Every weekend, you can find a festival. Communities come together quite frequently here. It’s quite a nice change from being shut up from my neighbors in DC. 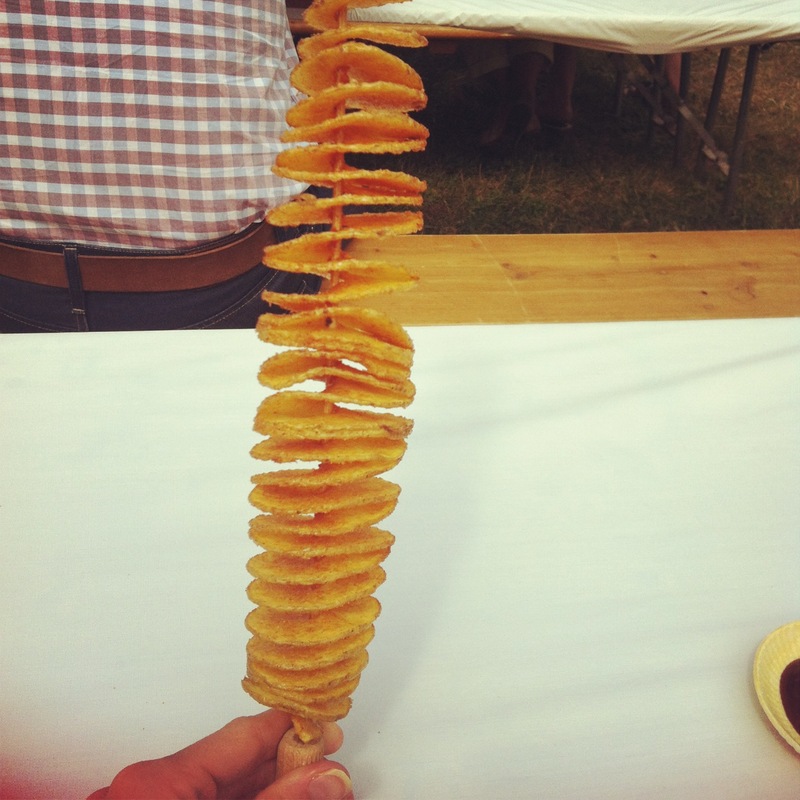 This is a french fry! Yes, it is, on a stick. It was fried right in front of me. So good! 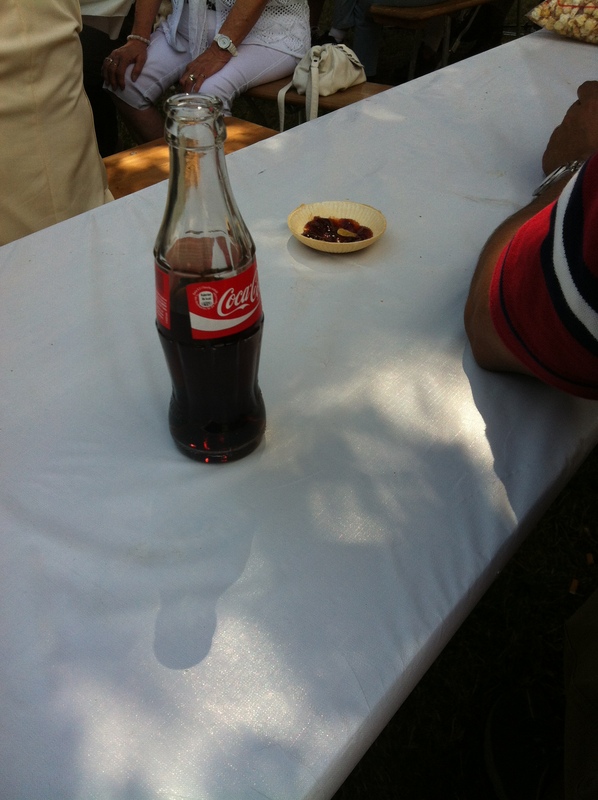 I would like to introduce you to a piece of my childhood, when Coke tasted like Coke. Yes, it exists without HFCS and it’s still just as good as it once was. For those of you who know me well, you know I don’t drink Coke. I was way to curious not to try it, and I was so glad that I did. Little man enjoying the festival. That is NOT his beer. The next picture is from Kindsbach at an Italian/German restaurant. You have never seen so many Italian/German restaurants in your life here. The food is still excellent. 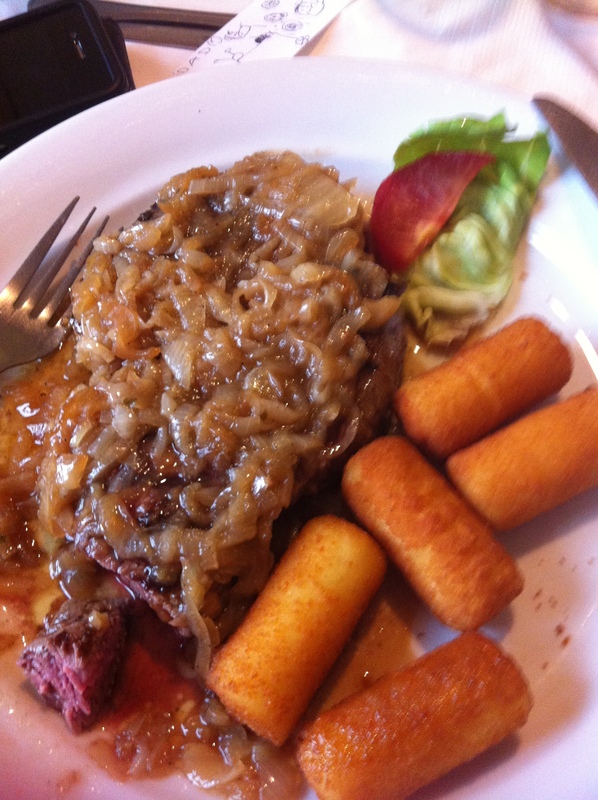 German rump roast w/ onions & potato croquettes. AMAZING! 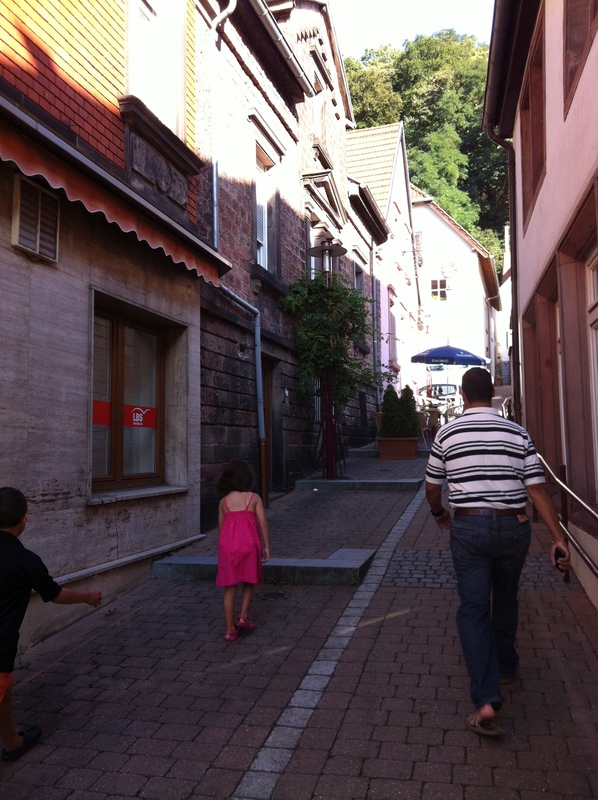 We even have made our way into Landstuhl and had dinner and some amazing ice cream. The restaurant was authentic German. I had schnitzel and potatoes with a glass of wine. The kids are really liking schnitzel and ice cream, but not so much anything else. Cute street the restaurant is on. 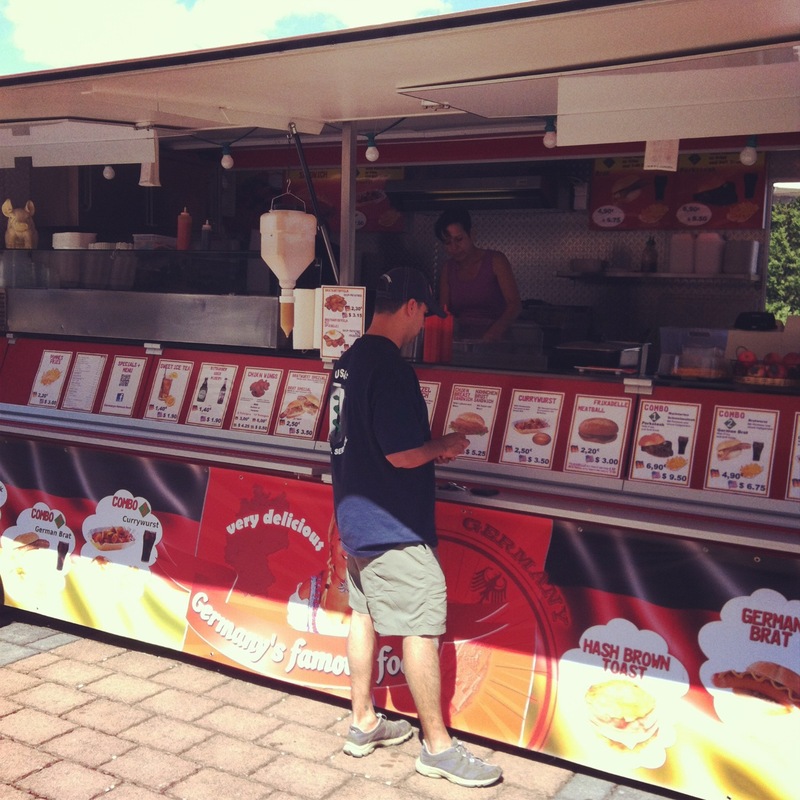 Lastly, I give you my first German food truck experience. If you aren’t a brat fan, you would be after having these. Germans know brats and know them well. I was happy to have some veggies in the form of cabbage. My mom has been asking me about the dessert. With my sweet tooth, I am pretty shocked at myself for not seeking out strudel. I guess that is next on the list after my stomach recovers from my binge. Emma did make her first Apfelkuchen (apple cake). I have to change a few things but I will share it when it is ready. My first German Food Truck. 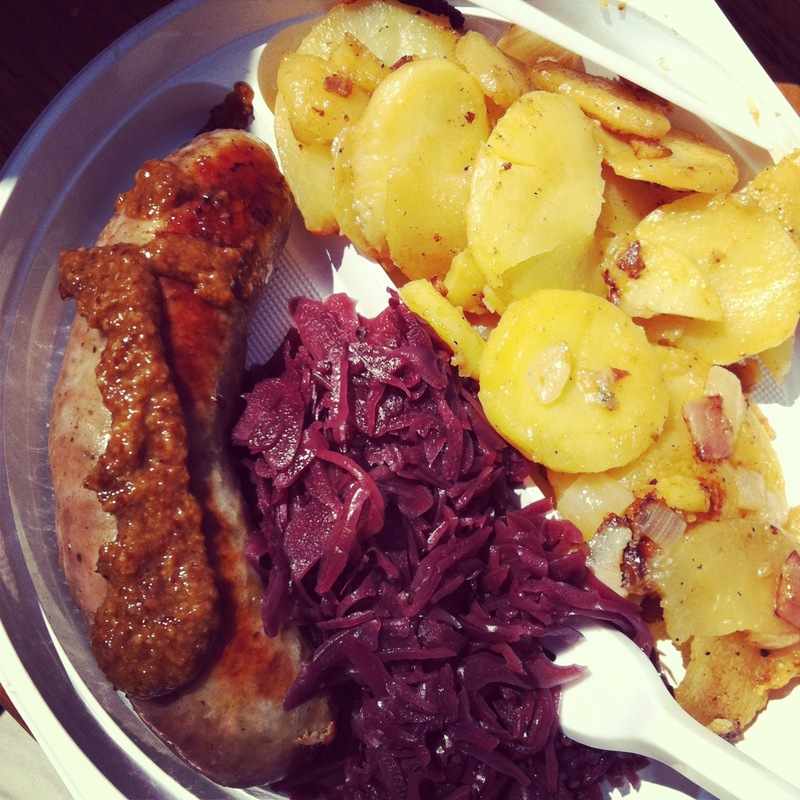 Delicious brat, red cabbage, & of course, potatoes. I swear I don’t usually complain this much. I hope you can cut me a break seeing that in the last year, I have endured a deployment and now an overseas PCS. In this complicated military life, I have learned after each PCS that I get the blues. Moving is overwhelming, but moving to another country in a small apartment where nothing is familiar is another level. While I was ready to move on from DC (which I am sure we will return), it is always hard to leave in a sense. I feel like I leave a part of myself behind in each location. In this case, I left a job and a career I was building for myself as an entrepreneur. For 3 years, I developed a website, created contacts, developed relationships, and threw myself out into the wild blue yonder to have a career that revolves around my kids and our moves. 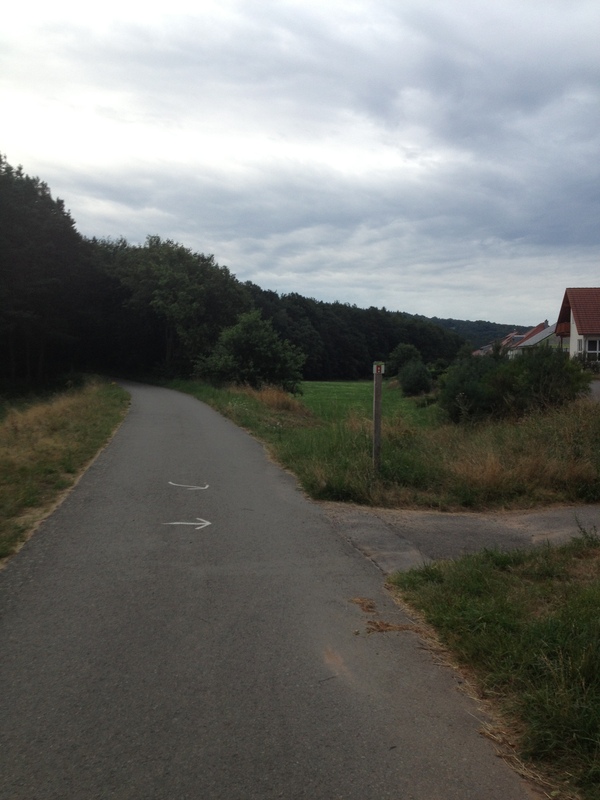 Well, then we move here, Germany. Guess what? All my hard work starts paying off, I get offers for trips to network, interviews on local networks, and to speak right in the middle of our move. It’s kind of hard to do any of that when I live on another continent. It’s not that I can’t do some of those things, and I don’t want to be here. I do. Before you judge me and label me a complainer, I hope you realize how much military families go through to serve their country. The spouse sacrifices just as much if not more at times. It’s not like have anyone to complain to right now either. To add insult to injury, I dread the whole “find a friend” bit. It’s so draining to have to reinvent yourself every 2 to 3 years, so I am whining, crying, and pouting about it. It won’t last long, just a day or three. I was apart of a group of fantastic ladies at my church in DC. It was a group of military spouses who will never know how much strength they gave me. They made me feel normal in my not so normal life. I felt at home just being in their presence. It was at one of our meetings where a seasoned (now retired) military spouse spoke to us about blooming where we were planted. It means more to me this time, and I don’t feel so bad about feeling blue. I know that it’s part of the process, and you do have to mourn your life in a sense because it’s drastically changed, AGAIN! It gets easier with each PCS, but it is always there. So I may retire to my bedroom for a day and cry my heart out, but don’t feel sorry for me. It’s a blessing. It’s an opportunity for me to grow and rely on God more. It’s a test of my heart and my passions. I know that I only get stronger and more determined from here after the dust settles. I do give myself the permission to adjust, cry, and mourn what was so I can embrace what is and move forward. Thanks for indulging my little pity party. It just helped to put it out there and say it. Well, today our family is complete. J got here around lunch time. We immediately got down to business and accomplished a few major things. I think Coco was the most excited. She was leaping through the apartment like a gazelle. 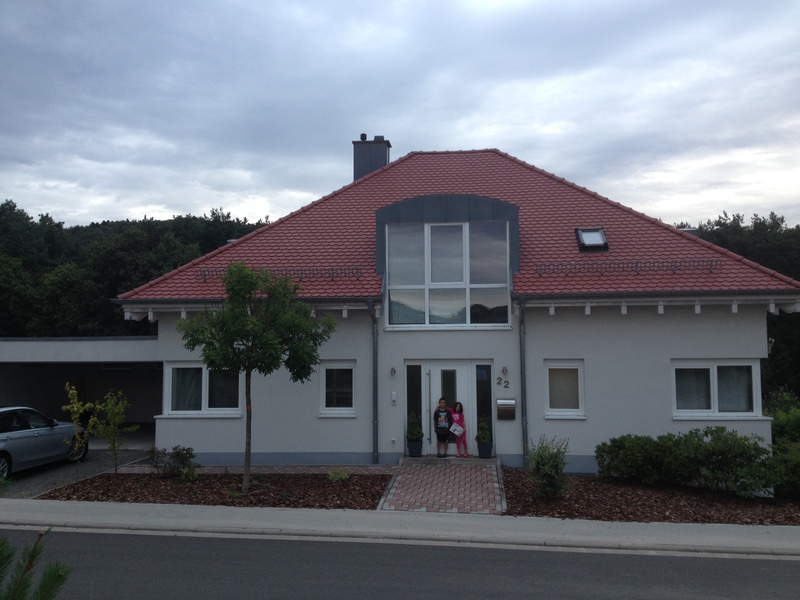 If you are wondering where we are staying, we are in a 2 bedroom apartment in Kindsbach until we get our furniture. 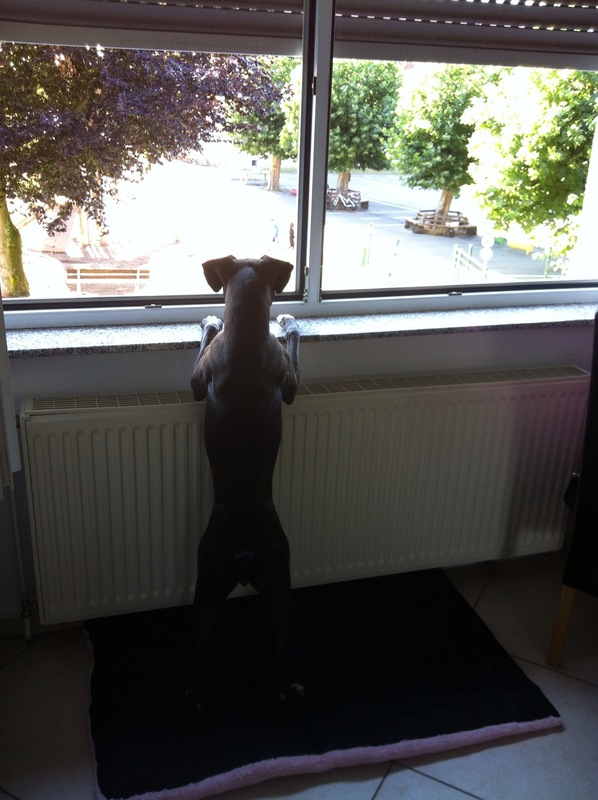 It’s cute, and I get to watch the kids in the park from my window with my coffee (so does Coco). I also got to walk to the bakery just a block away this morning. It is such a quaint village. I keep hearing Belle from Beauty and the Beast in head singing, “Little town. It’s a quiet village.” It’s one of my favorite movies, but I seriously feel like I am in a fairy tale. The church is in the center of town, and I absolutely adore the sound of the church bells. It’s quite the change from the CVS and Honda dealership noise I used to get. Nothing is simple here, yet everything is simple. Crazy, I know. There is no Walmart or Target to run to down the street. I realize how spoiled I am now. 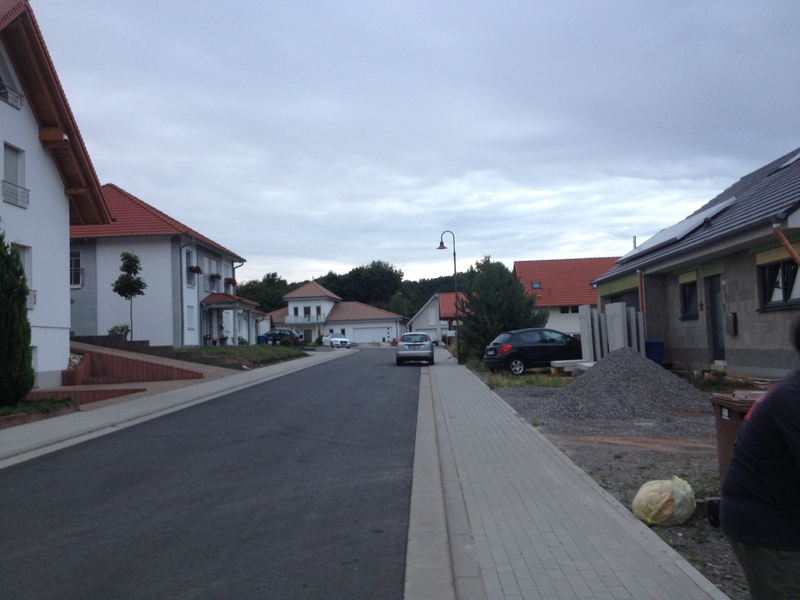 I also realize how well Germans take care of their stuff and their environment, and how Americans have a long way to go. While I am still adjusting, going to the new house makes me so unbelievably peaceful. 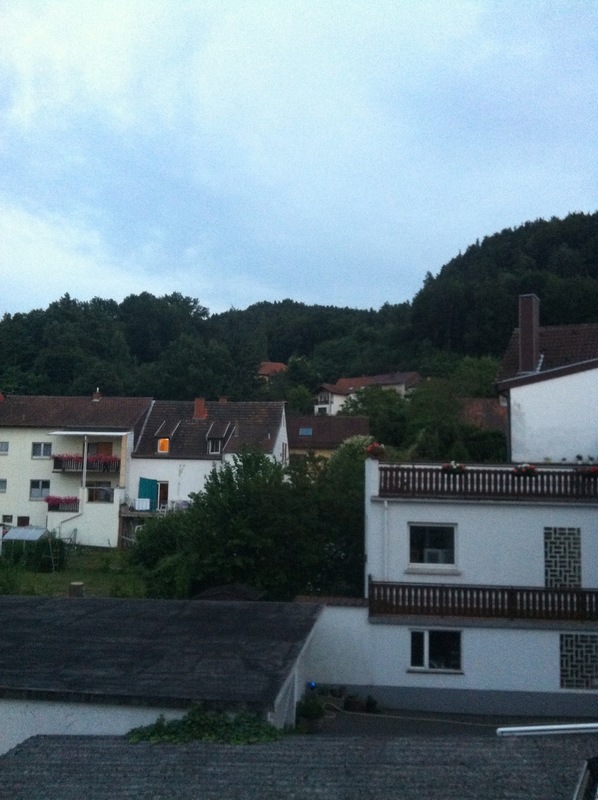 The trees, the National Park in my backyard, the village, and the house itself make me relax. I have needed this for such a long time. My whole family needs this. I can’t wait for us to move in and get into a routine. Here’s some pics so you can see what our new world looks like. PCS means Permanent Change of Station in the military world. In our family, we do this about every 3 years. No PCS is ever perfect. It always has its own set of “challenges”. This PCS in particular has left quite the mark. I have only cried twice so far. I must say that is an improvement from the past. Regardless of these ‘fails’, I will be excited to be here when all the crap washes off. Moving is always a process. It doesn’t mean I am miserable, it just means I am being honest about where I am at the moment. I am looking forward to looking back and sitting in wonderment of how I did this alone. God definitely has some strong arms because He is the only one holding me up right now. Before I share these with you, I should tell you how insane it has been lately so you can understand why we have so many ‘fails’. JR returned from deployment at the end of May. We jumped right in get our orders mode, which is an insane process all on its own. Readjusting to being back together was tough but we were at least focused on something else. The kids finished up school and dance. We jumped in the car and drove to Tennessee to get some of our stuff and visit family. We returned to get our house in order to rent in DC. Unexpectedly, we had to get renters for our home in Oklahoma. JR spent the week before our pack out with his mom in another state due to illness. (Please keep her in your prayers). Then we went to live in temporary housing on base. JR went TDY for a week, and we came here. That’s all in 2 months, folks. That’s enough for a lifetime but that’s our life. Many other military families have been through much more and much worse so I do count my blessings through all of this. Getting this all down helps me find the humor in it all. 1. Don’t be passive if your husband is deployed when you get your RIP (notification of assignment). Stay on the EMFP process. Show up at their office. Don’t be shy! We got medical clearance way too late (not our fault) even though we had our stuff in early which resulted in very late orders. The late orders resulted in no availability in lodging on base for temporary housing and many of the following fails below. Definitely a big regret of mine now. 2. Give your wife, who is traveling alone with your children, the correct time of the flight. Don’t make her show up at 2 when the flight is at 1050. The 8 mega heavy bags are not fun to carry around the airport with children. Thank God for sister in laws who rescue you from 6 hours of misery! 3. Don’t go to an overcrowded USO who makes you get rid of your cart and yell at you for taking a drink in the wrong area. It’s not worth it. Just don’t do it. You are all ready in a fragile state from the wrong flight time. 4. Make sure you have the correct orders when checking into your military rotator flight to another country. Make sure you and your children are listed on these orders or you will have a break down among 100 airmen and soldiers who are on your flight. 5. Don’t forget to charge your phone before you leave your house. Otherwise, in the middle of your mental breakdown in the airport, you can’t call your husband to fix the orders. 6. DO NOT leave the country without COFFEE! Yes, it’s true. You think you will just pick some up at the commissary but it’s rationed in Germany due to some tax law. Yes, you could buy it on the economy, but you have no idea how to get to a store much less drag your kids. This incident alone set the tone for the insanity that follows. 7. Don’t forget when you charge your DVD player for the 7 hour flight to turn it off so you can use it on the flight. Yep, DVDless for 7 hours. 8. If traveling ahead of your husband, get a special power of attorney before you leave the states for housing. This holds up everything, utilities, VAT forms, coffee cards. Coffee is the most important thing here. 9. Don’t spend 2 hours putting together a tall fan because the instructions are in German. Chances are it will break. A table fan takes 5 minutes and no screwdriver needed. You will need to know that righty tighty and lefty lucy don’t apply here as well. 10. Try not to get an upper level apartment in the middle of a heat wave in a country with no air conditioning. If it’s 88 outside, it’s 98 in your place. 11. Don’t go looking for a portable AC unit at the exchange. It’s not there. You may leave in tears. 12. Don’t wait for the 3rd day to open a local bank account. It takes 3-7 days to transfer money. Therefore, no portable AC unit off base. Yes, there may be more tears. 13. Don’t crate your dog on a really hot day even if you have a fan on her. She may vomit everywhere to make your day super special. 14. If at all possible, do everything in your power to NOT take a TDY in route when you are PCSing overseas when you just got back from a deployment. This makes for a less stress on the wife. We all know “Happy Wife = Happy Life”. Again, you get no say, the military owns you. The military should really think about asking the spouses before having such braniac ideas! Hope you all learned a little something from my adventures in PCSing. I would love to hear about any epic fails you have had in moving. Well, hi there! 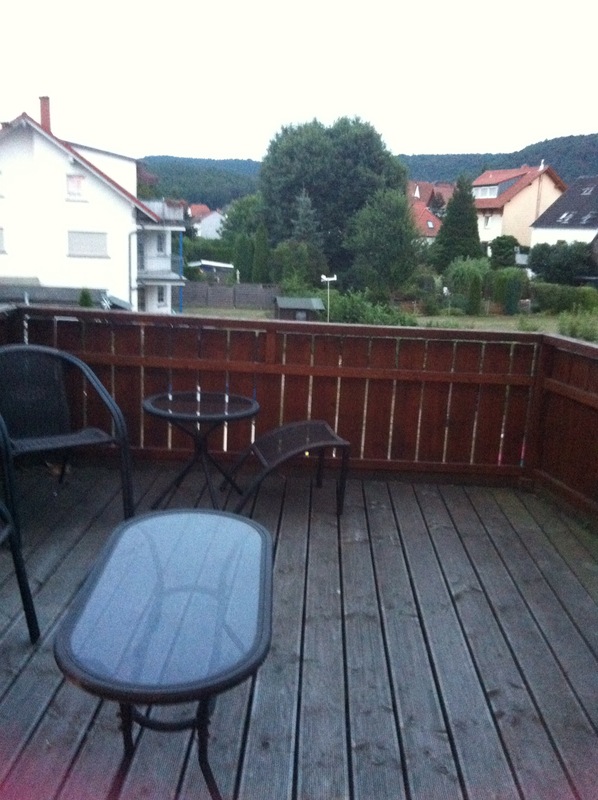 Welcome to my little spot of the world where I plan on sharing my so called military life with friends and family. I have been traveling the US for the last almost 9 years with my husband as he pursues his military career. So where does that leave me? Well, it leaves me frazzled most of the time, but it also leaves me with lifelong friends and fun I never imagined having. I chose Fahrenheit2Celcius as my blog name because we just crossed the pond and moved to Germany and everything here is in Celsius. It’s also a play on my love of baking and food. My world is upside down right now. 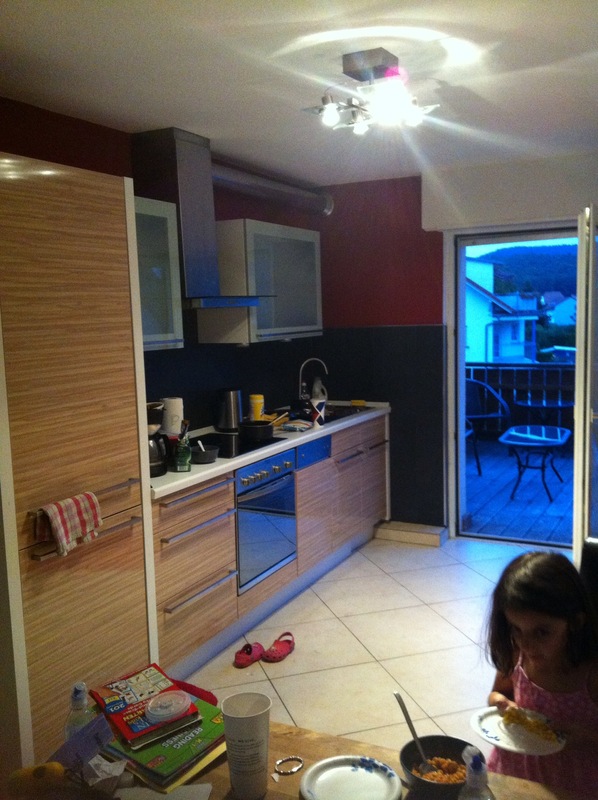 I moved by myself with 2 kids and one dog to a strange country where I know 3 people. Let me tell you, 3 is way better than none! For those of you who think you can’t do something, like move overseas by yourself with your kids, think again. You might find yourself doing it anyway. Mr. J is still back in the states for a TDY (temporary duty station for your non military folks or aka a conference). Yep, you read that right. That is a whole other post. But really, who does that?!!! Can you tell how annoyed I am? Well, I guess if he must he must. One of the first things I learned as a military spouse is that the military pretty much owns you, not just him. It’s hard to build a career for yourself when you move every 3 years, but you do build character, strength, endurance, and some pretty awesome kids along the way. This life is not for the faint at heart. God made me stubborn and strong willed for a reason. I guess it just may have been to live this life. For those of you that know me pretty well, you know that I love food, cooking, wine, and traveling. I plan on sharing all of our adventures over here so I am not clogging up my social media pages so much.